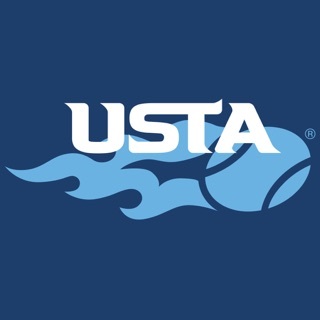 The United States Tennis Association is pleased to offer the official iOS app for the 2018 US Open Tennis Championships, designed and developed by IBM. Stay connected to all the action during the Open, August 21 to September 9, 2018. 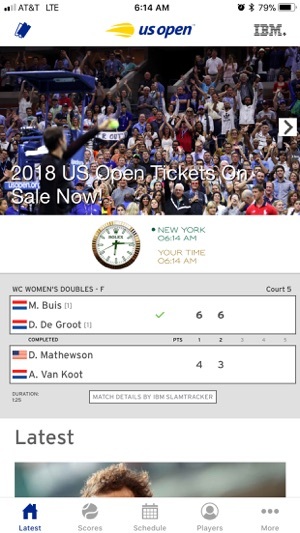 The interactive home screen offers fans an immersive experience into the US Open with immediate access to live scores and latest news, photos, and videos. 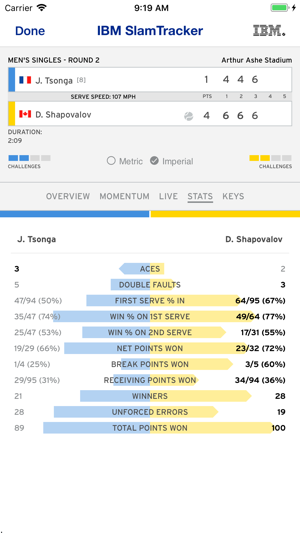 LIVE exclusive point-by-point scoring updates, completed match results, statistics, match insights and IBM Keys to the Match during the US Open. 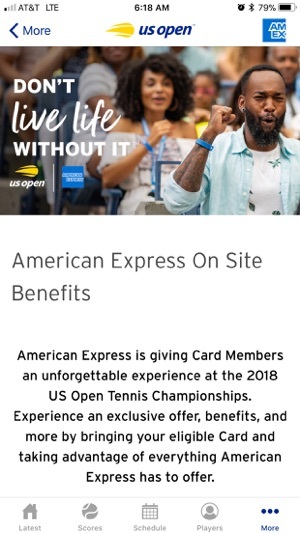 US Open Tickets are mobile-only. Use your phone to purchase, view, scan your ticket at the gate, or transfer your tickets. The Visit section is your main resource for all information regarding visiting the USTA Billie Jean King National Tennis Center including what you can bring, dining and food options, restaurants reservations, and more. Highlights, Official Schedule of Play, Player Bios, Draws, CHASE Charge & Watch, and Bracket Challenge. Everyone knows the US Open is the toughest slam on the tour but the heat pushed the players to the limit. It took the legs out of Roger and then Rafa and many of the top talents. And winning should be about talent and not genetic heat resistance or advanced fluid management. Yet these matches showed off the exquisite beauty, physicality and tactical complexity of the sport as well as any in the great 50 year history of the Open, which I’ve attended each year since 1969. The frustration of this year’s tournament came only in its closing moments when bad judgment, bad behavior, bad sportsmanship and unrealistic expectations cost the new and fabulous women’s champion the elation she should have been able to enjoy with her family, her team and her fans. So the 50th anniversary of the Open, which should have ended in perfection, was instead tarnished by a desperate player unable to avoid her own sense of entitlement. 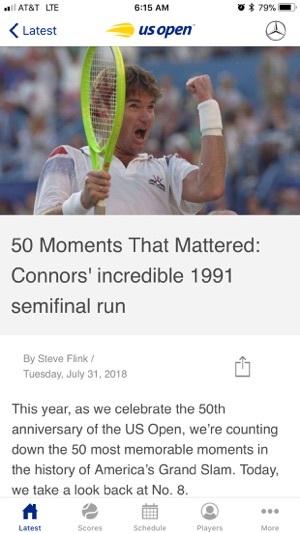 But the sport is bigger and more precious than any such distraction and Naomi Osaka, finally fit, motivated and focused, will bring her talent back to Flushing Meadow for many years to come and she will always be remembered for her humility, grace and her undeniable title as the 2018 women’s champion of the US Open. And...oh yeah.... Nole was pretty good too! Update saturday 9/1 - I enabled push notifications. 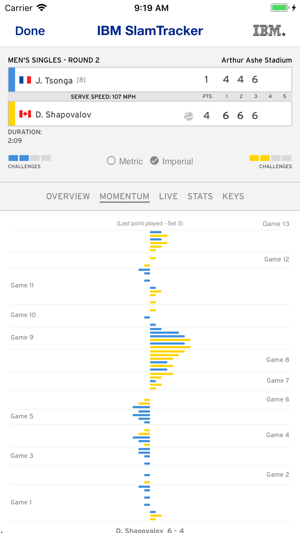 The problem is it has no controls options for match start, mid-match scores, final scores. MLB app knows how to do this well. I want to be reminded when a match starts, but not learn blow by blow scores before i’ve watched a recorded match or am a few minutes behind in real time while watching. 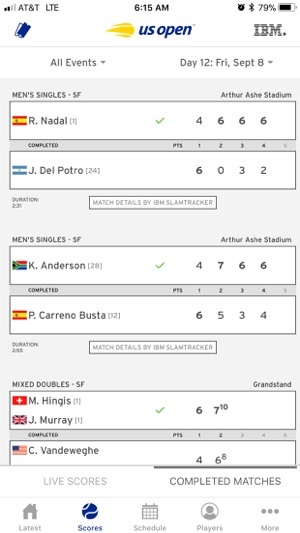 So, today, I accidentally glance at my phone to learn Madison Keys won 3rd set 6-2, while I was still watching at 3-2. Dang. Have to shut off push notications. Pretty useless. One of the better slam apps. This app seems to have achieved the goal of proficient integration of a variety of ads with US Open content. 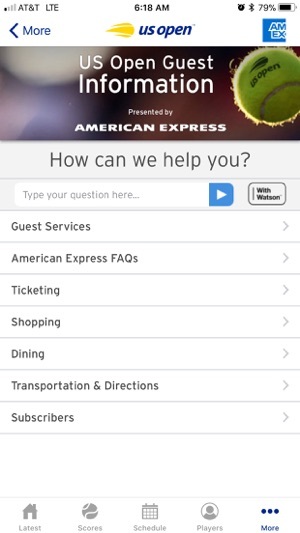 So far the app features & ads have functioned smoothly. I guess I am not sure if the number & length of ad videos that I have to watch at the beginning of most of the relatively short highlights/interviews/features is worth my time, especially when seeing the same ads repeated. But the app itself is much better than in previous years. Glad to hear it. We implemented the skip functionality based off the feedback we received!